Over the course of months, I have received a lot of requests to do a post on my personal collection of fountain pens; in other words, to show the pens I have decided to keep over the years. To be honest, it seems really boring to me to look at someone’s personal collection, especially if that collection contains a number of no-longer-available pieces, but the people have spoken. 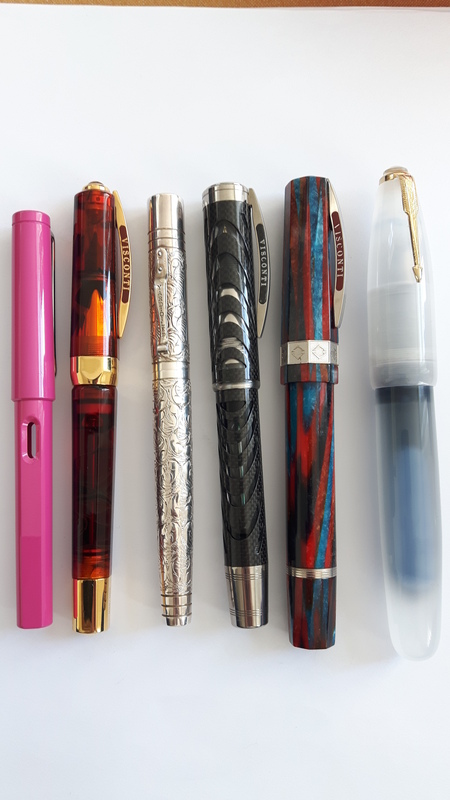 I have chosen to turn this into a written post; in principle, all of these pens have been (or will be) reviewed, so the interested reader can always use the index at the top of my website to locate the reviews of individual pens that are of interest. Based on anecdotal evidence, my viewers seem to like anecdotes, so I have tried to give a bit of a backstory to all of these pens. I took these pictures myself, which explains why they’re not of the usual spiffy quality Gourmet Pens provides. 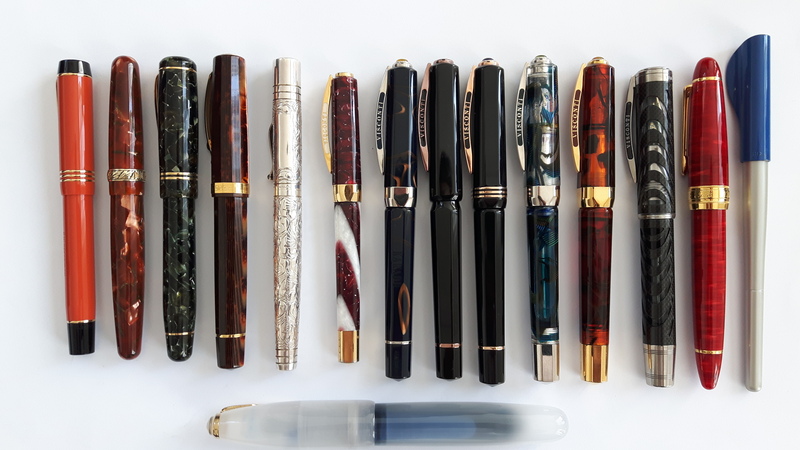 I did not create this post to provide eye candy, but to try and explain what it takes for a pen to remain in my collection. Again, if you want to see more of a pen, or see it in action, consider watching my review of the pen. Now that you’re all sitting comfortably, we can begin. This is what I consider “my” collection, which means that these are pens that I actually use and ink up. We have more pens, a number of which belong to Gourmet Pens (mainly vintage). 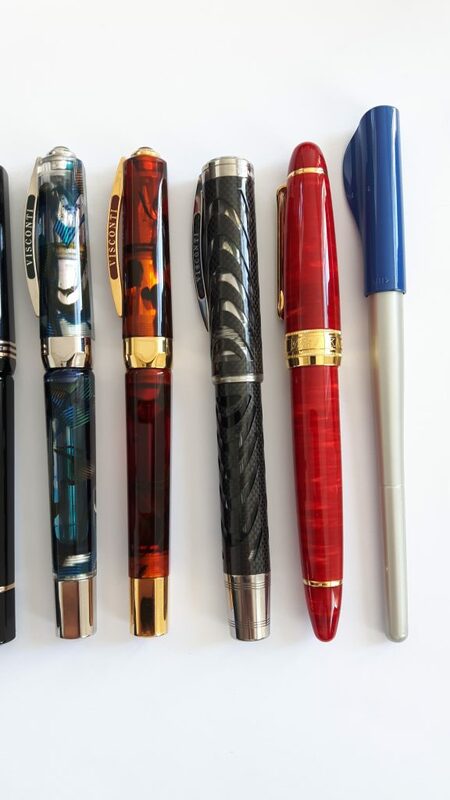 As you can see, I do not own hundreds (or, as some viewers appear to think, thousands) of pens; whatever I do not like enough to keep is given away or sold (and before you ask, because some people will, I am not in the habit of giving away Viscontis to random strangers). So, let’s go through these pens in small clusters and see what they are all about. Conway Stewart Winston, 18k broad nib. This pen was sent to me by John from the UK, and I absolutely love it. It’s stunning celluloid over a brass liner, so it is a pretty heavy pen that is rock-solid. The nib required quite some work to make it write exactly to my liking, but now it is perfect. I don’t like the filling system (a kind of built-in converter/faux piston), but the size, weight, and feel of the pen makes up for that. Stipula Etruria Volterra, 18k italic nib. Another beautiful celluloid model. Just a humble cartridge/converter pen, but the nib is stellar. A juicy, crisp italic that allows for superb line variation and that wrote exceptionally out of the box. I ran into this pen at Akkerman in The Hague and I couldn’t resist. Parker/Akkerman Duofold, 18k italic nib. Not only is this a beautiful fountain pen (the orange and black really works), but it was a limited edition to commemorate the 100th “birthday” of Akkerman in The Hague. What adds to this pen’s appeal is the nib: a vintage stub nib that is no longer in production. One of the things I dislike about modern Parker pens is their boring nibs (in my neck of the woods, the choice is typically rock-hard fine or rock-hard medium; broad is hard to find, and only the Sonnet nibs have a bit of yield, it seems), but this nib is really something else: crisp, excellent flow, and beautiful line variation. OMAS Paragon in Arco celluloid, 18k fine nib. Who says I only use broads or italics? This pen is not only made of one of the most gorgeous celluloids I have ever seen, but it has a stellar nib. The fine nib on this pen is among the smoothest nibs I have ever used, flow is rich without gushing, and the entire pen is just massive without being overly blocky or heavy. The facets of the pen really highlight the celluloid. Yard-O-Led Viceroy Grand with Victorian Finish, 18k broad nib. This pen was sent to me by John too. Years ago, I was in London for a course, and I walked into Fortnum and Mason, an old department store where the shop clerks still wear coat and tails. The store has a nice stationery section that stocks Yard-O-Led and I held this pen model. I was blown away by the pen’s size and, particularly, its weight. Being constructed out of solid Sterling silver, the pen weighs a lot. 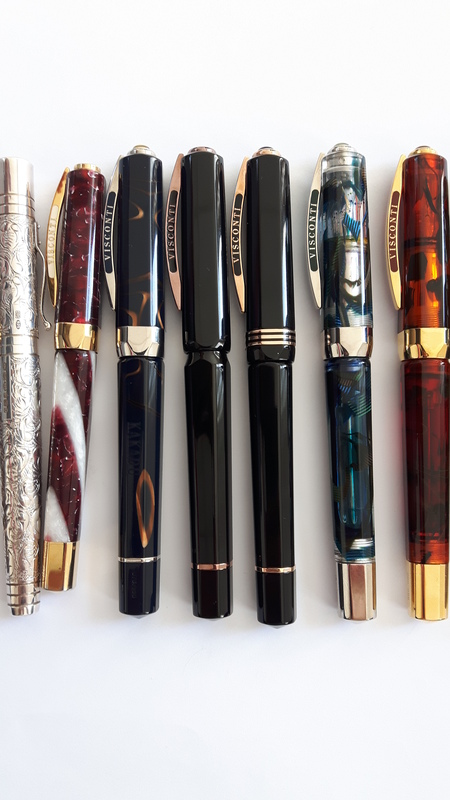 At the time, I couldn’t bring myself to spending that much on a fountain pens (“The times, they are a-changin'”, so quote Bob Dylan), so I passed it up – and I regretted it ever since. So, when John offered to send me his because he was thinning out his collection, my heart rate went through the roof. Too break it down simply: this is pretty much a perfect pen. Its weight, size, finish, and performance are all top notch. A juicy nib, a perfect balance, and visually, the pen is perfect. Visconti Opera Elements Fire, 14k medium nib. Regular viewers of my videos will know that this is one of my favourite pens of all time, and that is because this was the first “serious” pen I ever bought. If this pen would not have performed the way it did, you would probably not be reading this, because SBREBrown the fountain pen reviewer would not exist. This really was a pivotal pen. The celluloid is stunning, and the nib is perfect: springy, juicy, and just an overall perfect performer. Also, I bought this pen with some of the inheritance left to me by my granddad, a life-long fountain pen lover, so there are some emotions at play here too. Furthermore, this was the first serious purchase I made from La Couronne du Comte, which has evolved into a great relationship with the store’s owners. Visconti Kakadu, 18k medium nib. A limited edition for the Australian market; just a little bigger than the Opera Elements, but a bit smaller than the Opera Master. This is a great pen, that’s actually a very deep blue and not a black like the picture suggests, which has a nice brown swirl. I love this pen so much that I took it to my PhD defense to take notes. The pen writes perfectly all the time, every time, and it is a great size. Also, being a power-filler, it holds a serious amount of ink. Visconti 25th Anniversary Urushi in Rose Gold Finish, 23k palladium broad nib. Gourmet Pens spotted this pen for me at the 2015 Tilburg pen show and I could not resist getting it. Ther are 25 of these, as they were made for Visconti’s 25th anniversary. I love this pen because of the Urushi lacquer, which makes it ultra-black in a way that is pretty much undescribable. I do think it is more of a bronze finish than a rose gold finish, but I do like the contrast between the black and bronze. Also, the nib is perfect: juicy, wet, and it does not skip or hard start. Visconti Australis, 18k medium nib. Another exlusive for the Australian market. Made of “lucite”, it is a nice, shiny black. Being Master-sized, this is a large pen, but because of the material, it is remarkably light, making for a very pleasant, non-tiring writing experience. Visconti Opera Master Demonstrator, 23k palladium double broad nib. This was the first Opera Master I found (also at Akkerman in The Hague) and I immediately fell in love with the model. Big, heavy, perfect shape, perfect filling system (power-filler). I love this model, and I think it is a great writer. Visconti Opera Master Tobacco/Tortoise/Turtle, 23k palladium double broad nib. I saw Bertram Oser from Bertram’s Inkwell use this pen in a video that was recorded years ago, and I immediately wanted one. I couldn’t find one for years, but then Gourmet Pens found me one. I got it, and I absolutely love it: this pen has such a magnificent finish; a deep, warm hot toffee-brown… Just stunning. This pen is always inked up. 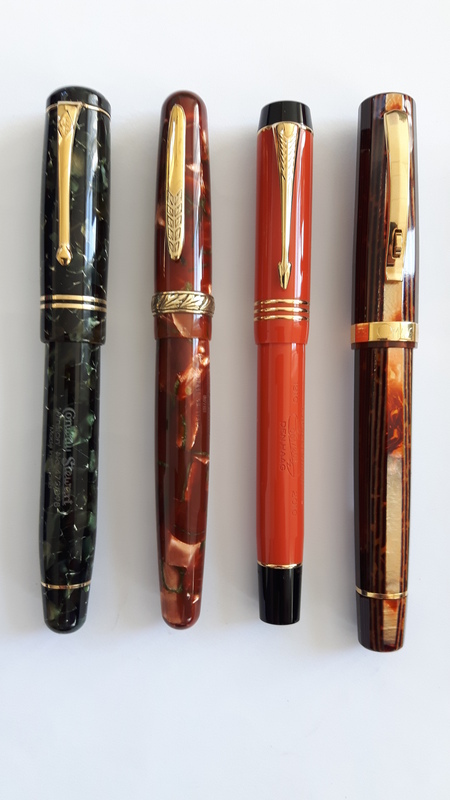 Left to right: Visconti Opera Master Demonstrator, Visconti Opera Master Tobacco, Visconti Carbon Dream, Classic Pens LB5, Pilot Parallel 6mm. I’ve covered the first two pens in this shot already, so we will have a look at the other ones, starting with the grey one. Visconti Carbon Dream, 23k palladium medium nib. I bought this pen on my birthday (again, at Akkerman in The Hague; do you see how dangerous this shop is?). It’s a big, heavy pen, with a carbon fibre-finish. What you cannot see well in this picture is that the barrel is transparent, so the dark bits you can see between the carbon fibre Vs is actually ink. This pen has a relatively stiff palladium nib, but it is superiorly smooth and I absolutely love using it. It is very wet and it just writes beautifully. This pen is always inked up. Classic Pens LB5 Kaen, 21k Nagahara Cross Point nib. This is as close to perfection as any one fountain pen can get, I think. The finish of fusion-bonded acrylic is stunning. To be honest, I have no clue what fusion-bonded acrylic is, but let me tell you: pick up one of these pens and you will be blown away by the depth of the material. Also, I got this with a Cross Point and that makes for some extreme fun in writing, as it ranges from extra-fine to about triple/quadruple broad depending on the user’s writing angle. Gourmet Pens gifted me this pen (obviously, a magnificent gift) and she purchased it from my friend, the One Man Penshow Sarj Minhas. This pen is always inked. Pilot Parallel, 6 mm steel nib. This is not a joke; I actually use this pen. I like doing (or, more accurately, attempting) calligraphy and I like it big… So I love the 6 mm Parallel. These pens are great to add some flair to a postcard too. Left to right: Lamy Safari (for size comparison), Visconti Opera Master Tobacco, Yard-O-Led Viceroy Grand, Visconti Carbon Dream, Visconti Speakeasy, Guider Super Zimbo. I added this shot mainly as a size comparison of some of my favourite pens next to a Lamy Safari, but the final two pens have not yet been covered. Visconti Speakeasy, 23k palladium medium nib. This pen is huge, the celluloid is stunning, and it has a hidden booze compartment (and I do not even drink!). The nib is stellar and springy, and I love the pen’s looks and feeling. However, the ink capacity is pretty useless: it only fits a microscopic converter or standard international short cartridges, and those cartridges do not even fit in easily without scraping the plastic off of their sides. Still, the imposing size of the pen makes up for a lot. Oh, and this is yet another one picked up at Akkerman in The Hague, during a short stay in a wonderful beach hotel in Scheveningen (close to The Hague), so whenever I use it, I am reminded of some beautiful summer days filled with relaxation and great food. Guider Super Zimbo, broad steel Laban nib. Yup, this one is pretty affordable. Its size is absurd, and it is way too fat to be used comfortably for longer writing sessions. That is why I keep this pen inked up with water-resistant iron-gall ink to address envelopes or fill out forms. And there you have it: my personal collection of fountain pens, by public request. Clearly skewed towards the Italian side, and it does not include a lot of 20-dollar pens. Bear in mind that this is my collection of pens that work for me, not a list of pens that I think anyone should own or rush out to get. For example, if you have smaller hands, you will probably be unable to use 90% of the pens shown here. This entry was posted in Fountain Pens, Information and tagged collecton, fountain pen, of, personal, sbrebrown on June 26, 2016 by sbrebrown.